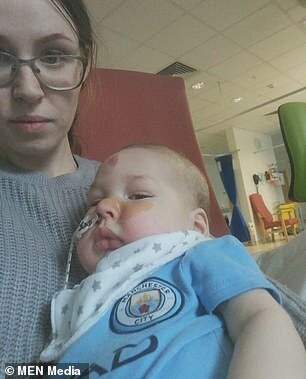 A six-month-old boy with a devastating genetic condition has been given just three months to live unless the NHS funds a ‘miracle drug’ that could save his life. 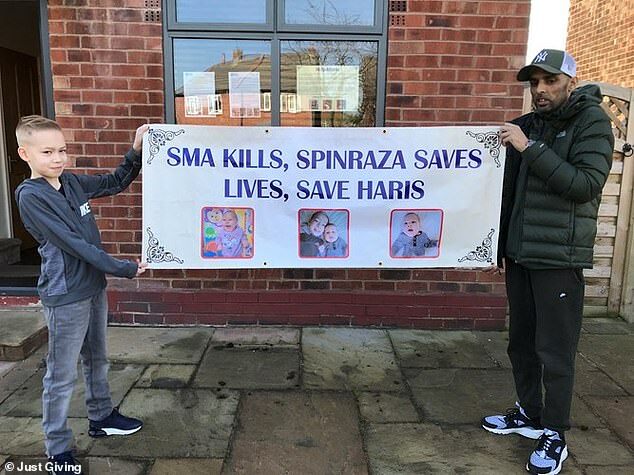 Haris Khan suffers from the genetic condition type 1 Spinal Muscular Atrophy (SMA), which makes muscles weak, leaving sufferers unable to move, swallow or even breathe. 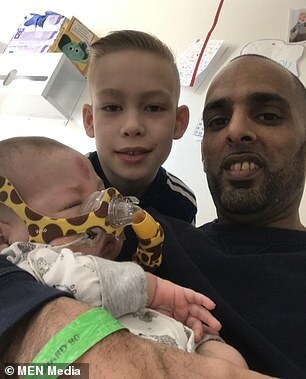 Since being diagnosed on Valentine’s Day, Haris wears an oxygen mask and has not left the intensive care unit at Royal Manchester Children’s Hospital. 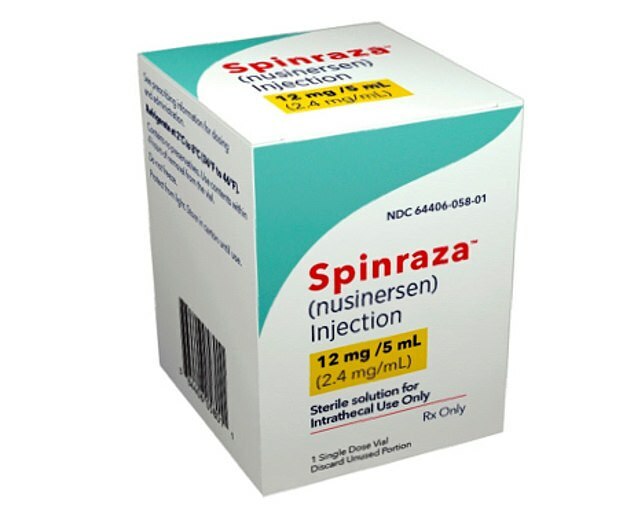 The NHS funded a life-saving SMA treatment called Spinraza up until last November. However, the National Institute for Health and Care Excellence (NICE) stopped recommending the drug on NHS England last summer, claiming its cost is ‘too high for it to be considered a cost-effective use of resources’. Speaking at his son’s bedside, Haris’ father Shakeel Khan, 31, tearfully said: ‘This is England, it’s not a third world country. ‘My family are from Pakistan. I’m born here, my dad had cancer removed the day Haris was rushed to hospital but we can’t help a little kid who’s six months old with a genetic illness? ‘Only a 100 babies a year maximum need that treatment. SMA affects around one in every 10,000 babies worldwide, according to SMA Support UK. The first British girl to receive Spinraza – Annabelle Rose Thomas – was then able to come off breathing support, swallow food and has even ridden a horse. The pharma company Biogen makes the drug, charging almost £600,000 (around $797,900) per person per year in the US. Biogen is offering Spinraza – which is still available in Scotland – at the lower price of £450,000 ($598,460) for the first year in the rest of the UK. It also offered an undisclosed discount to the NHS, but it was still not enough. All seemed well when Haris was born last August, with staff at Wythenshawe Hospital describing him as a ‘happy, smiley, friendly’ baby. 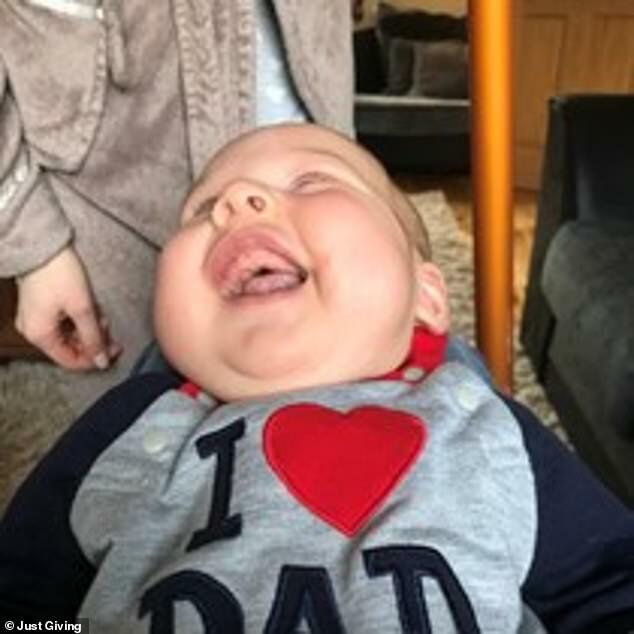 But when a health visitor came for an eight-week check-up last Ocotber, she noticed Haris could not move his head properly. ‘He had no head control at all, it’s known as floppy baby syndrome,’ Mr Khan said. Spinal Muscular Atrophy (SMA) is a disease that weakens one’s physical strength by affecting the motor nerve cells in the spinal cord. Those affected never gain or lose the ability to walk, eat, or breathe. SMA is the number one genetic cause of death for infants. SMA is genetic and passed from parent to child. The health visitor requested an ‘urgent’ appointment, however, Haris was not seen until December 27. He was then diagnosed with hypotonia – decreased muscle tone – and recommended physio once a week. The family believed he was progressing, until, at the end of January, Haris suddenly became very ill with a cough and a cold. After several visits to their GP, his parents rang 999. Haris was rushed to Wythenshawe Hospital, where his condition rapidly deteriorated and his respiratory system collapsed. He was intubated, with the family going back and forth between Alder Hey in Liverpool and Manchester due to a lack of beds. After a week at Royal Manchester Children’s Hospital, they thought Haris was improving. He was even due to have his intubation tubes removed. But following further tests, the family were given the devastating diagnosis. ‘They said “we need to get you to [a] meeting [room]”,’ Mr Khan said. ‘I walk into [the] room and something tells me something’s not right. ‘There’s a family liaison, three neurologists, two consultants, a bed nurse and wing nurse. ‘The week before the result, I’d been talking to the nurses saying “I can accept any result, because I already thought I’d lost Haris”. ‘They start saying your son has spinal muscular atrophy. I thought “that makes sense because he can’t hold up his head”. ‘Then they said “I’m sorry, there’s absolutely no treatment and your son has three months to live”. As if the situation could not get any worse, the family were then told treatment is available in Scotland but not England. ‘We would relocate in a heartbeat if it meant we could save Haris,’ Mr Khan said. But the family have been told NHS Scotland will not accept patients who have simply relocated and the treatment is only available for genuine residents. On March 6, Haris’ family will be staging a peaceful demonstration outside the headquarters of NICE in Manchester ahead of a crucial meeting. NICE is expected to announce a decision on whether to start funding Spinraza on the NHS in England again. 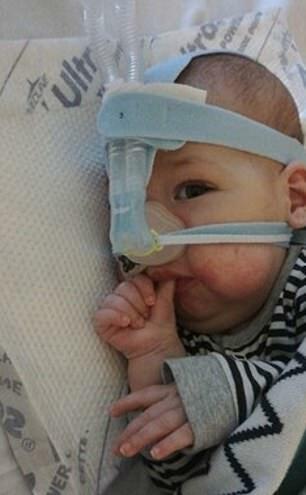 ‘Babies like Haris are being used as a bartering tool,’ his father said. Mr Khan and his wife Renata, 26, are not working while they focus on helping Haris get the treatment he needs. ‘Who needs money without a family?,’ he said. ‘Any money in the world is nothing if you don’t have a family to enjoy. ‘The best I can do is to save my son or keep [him] with us for as long as possible. Despite all they have endured, Haris’ parents are determined to stay positive. ‘SMA has changed a lot in the last 15 years,’ Mr Khan said. ‘I’m speaking to people who’ve been treating their children for the last three or four years and got them to five-years-old with love and dedication. ‘These people give me strength and inspiration that my Haris can do that as well. ‘The world miracle is in our vocabulary for a reason – yes it’s very rarely used, but it does exist. This is what we’re clinging on to. ‘From what I can see from Haris, he is fighting. He is fighting hard. But despite Mr Khan’s optimism, Haris’ specialist neurologist, who diagnosed him, is ‘adamant’ the youngster will not make his first birthday. Due to the parents being carriers of the gene for SMA, there is a strong chance any other children they have could also have the condition. They have therefore decided not to have anymore. Whatever the outcome on March 6, Haris’ parents do not want other families to go through the same ordeal. ‘We might only have my Haris for a few months, so I’ve got to create a legacy for him,’ Mr Khan said. ‘The NHS don’t screen for SMA at birth. 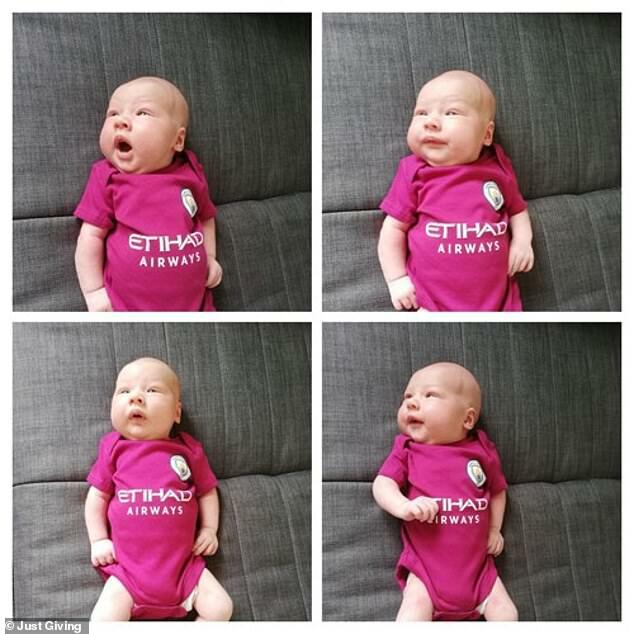 ‘Had they screened him in August when he was born, the treatment was available until November on the Early Access Programme. ‘Every SMA parent is waking up thinking ‘is this our son’s last day?,’ Mr Khan said. 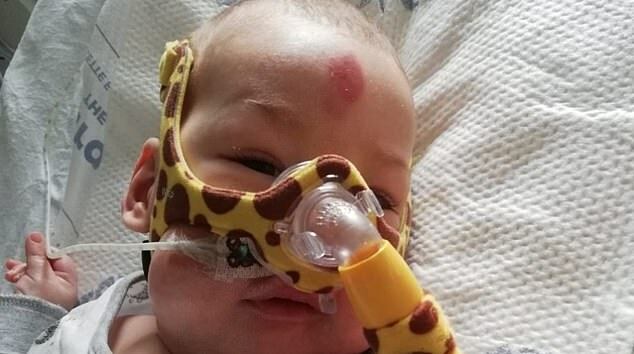 ‘Until a few weeks ago I thought SMA was a type of baby milk – now I understand what it is. ‘Haris hasn’t got a voice, that’s why we have to speak up for him. A spokesperson for NHS England added: ‘We understand how difficult and frustrating it is for families waiting for decisions to be taken on the funding of new treatments. ‘Which is why the company must price this drug responsibly and at a level which is both cost effective and affordable to the NHS. Haris’ family are fundraising to pay for treatment abroad. Donate here. 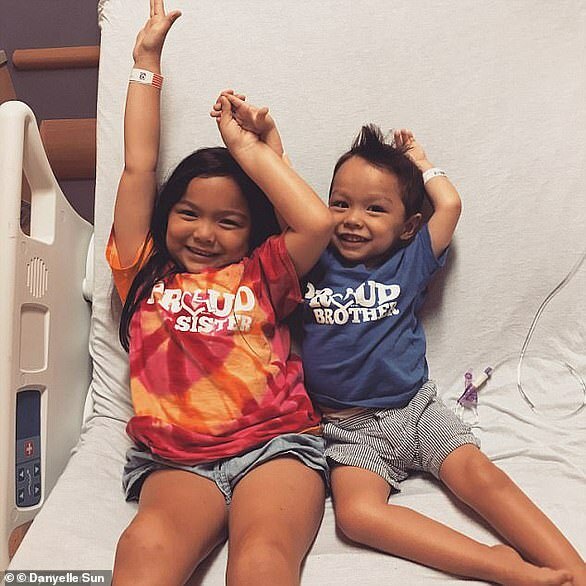 Ruby Sun, age six, and her brother Landon, three, have spinal muscular atrophy (SMA), which kills more infants than any other genetic disorder. But since the pair, from Milwaukee, Wisconsin, began getting treatments of Spinraza, in July, Ruby and Landon have already begun to make remarkable progress. 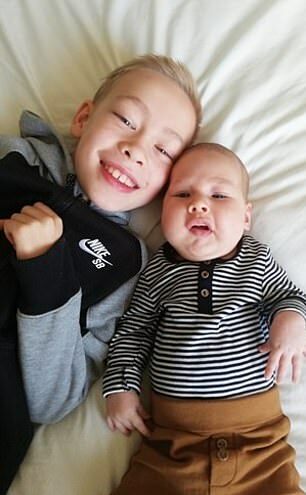 Ruby and Landon will have to have Spinraza injections for the rest of their lives, but a gene therapy in clinical trials could stop the disease in its tracks with just one shot. Ruby was just over a year old and had just started walking when she began to fall over very often and became weaker. By the time she was diagnosed with spinal muscular atrophy she couldn’t stand up. For years she has relied on a wheelchair to get around, but since being given Spinraza she has regained the ability to crawl on her knees, gets less tired, and can walk in a swimming pool. And her brother, Landon, who had to be surround by pillows when he was sitting up in case he fell over, is now sitting up without falling, has much better torso control, can reach for things, and has started kneeling again, their mother Danyelle says.